Meat is an essential part of a balanced diet for many of us, but there have been several recent scares about E. coli and mad cow disease as well as the increasing awareness of the potential risks to health that come from eating growth hormones and antibiotics used in meat production. Looking for high quality and humanely raised meat is important, because health and environmental problems come largely from bad hygiene, bad management and overuse of chemical and pharmaceutical products. Meat with an organic label ensures that the animal has been fed an organic feed and raised without antibiotics or growth hormones. When seeking out healthy meat products, lean meat is always the best. For poultry, this means white meat without any skin. Beef cuts that are leanest include chuck and sirloin steaks or tenderloin, while leaner cuts of pork include tenderloin and loin chops. Once you’ve decided on your cut, choose meat with little or no visible fat. Cut all visible fat from the meat before cooking, or if you are cooking poultry, leave the skin on the bird while cooking but remove it before serving. There are actually three main risks to barbecue cooking. 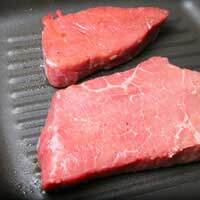 One is eating undercooked meat, which can contain germs like salmonella, E.coli and campylobacter, another is spreading those same bacteria from uncooked meat to food that you’ve already cooked, and finally the increased risk of certain forms of cancer from barbecued meat consumption. In the first case, a meat thermometer helps you be sure barbecued meat is really cooked through, and in the second, two sets of utensils, including barbecue tongs etc: one for cooking meat, the other for lifting cooked meat onto plates, will substantially reduce risk. In terms of cancer prevention, oolycyclic aromatic hydrocarbons and heterocyclic amines are two forms of carcinogen which are actually created by cooking meat at high temperatures. You have to eat a lot of them to increase your risk, but if you eat barbecued and smoked meat regularly you may wish to reconsider your consumption. Slow cooking and pressure cooking are great choices as they require no added fat and cook meat so that it is tender. They also require less seasoning such as salt which is something we should all be trying to reduce in our diets. Boiling is not a first thought for many of us, but foods such as frankfurters and saveloys can easily be boiled with no loss of taste. Grilling has great advantages for meats that already have a reasonable fat content such as sausages and burgers. Many foods that can be grilled can also be baked. Roasting on a grill or rack so that fat drips away from the joint can be a healthy option, as long as you drain that fat away and don’t use it to cook your roast potatoes. Finally, remember to drain fat away from meat both during and after cooking. Rest burgers and sausages on kitchen roll for a few minutes before serving to soak up excess fat and press down on roasted meats to squeeze out any excess fat during the resting period before carving and serving.